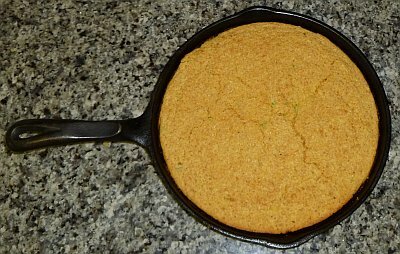 Corn bread is a traditional staple of Southern United States cuisine. The bread always has a hint of sweetness, so the recipes always have some sugar or honey. This recipe uses half of the sugar typically used, so it is not too sweet. The recipe can be spiked with several ingredients, including jalapeño peppers which give it an extra flavor kick. Preheat oven to 400°F. Melt butter in a 10-inch cast iron skillet on top of the stove at low heat. While the butter melts, combine the dry ingredients (corn meal, sugar, baking powder and baking soda). In a small mixing bowl, beat the egg with the finely chopped jalapeño peppers. Add the melted butter (warm, not hot) to the egg mixture and beat, then add it to the flour mixture. Add the buttermilk to the flour mixture and stir to make a thick batter. Pour the batter into the iron skillet and place in the oven. Bake for 25 to 30 minutes or until brown and a wooden toothpick inserted into the center comes out dry.